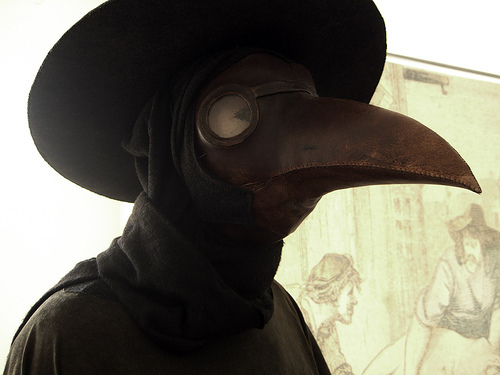 Dr.Dmatix, taking a local flu epidemic rather too seriously. Profile: Dr. Dmatix, Foundation researcher, is a man of a somewhat peculiar nature. Though he is usually fairly confidant, and can be trusted to handle situations that fit within his specific fields of interest efficiently and decisively, he can be unpredictable in other situations, especially when faced with diseases and germs, which he finds "icky". Show the man a rampaging bear made of quicksilver and chunks of human flesh, and he won't batter an eyelash. Show him a seven year old girl with chickenpox and he'll scream in a voice so shrill the girl will call him a sissy. History: Dr. Dmatix was first brought to the Foundation's attention by MTS Omega-131 ("Mirthbusters") commander ███ ██████, when he confronted SCP-1██ (a bear made of quicksilver and human flesh) without battering an eyelash when said creature broke into his place of work in search of a mate. The doctor managed to temporally neutralize the bear until the task force was able to contain it using nothing more than a fire extinguisher, a paperclip chain and a can of barbasol. He then proceeded to scream like a huge pansy and hide under his desk when he saw SCP-1██'s containment procedure (a seven year old girl with chickenpox rubbing her face against it).